when was the last time Earth’s atmosphere contained as much carbon dioxide as it may by the end of this century? All of the factors outlined above clearly point to the fact that geological forces, operating over tens of millions of years, caused Earth’s climate to cool dramatically during the past 35 million years. Claims that the cooling was caused by a reduction in atmospheric CO2 have been refuted by many. Studies of the Late Ordovician glaciation found that, without orbital forcing, ice sheets can grow with CO2 levels as high as 10 times preindustrial atmospheric level. Yet Kiehl maintains this fiction to the end, even to the point of reintroducing claims based on computer models. 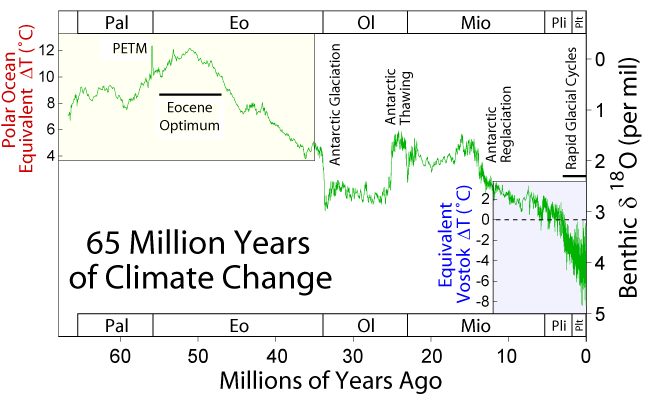 People that don’t believe in geology and are obsessed with temperatures can limit themselves to Wikipedia’s helpful graph “65 Million Years of Climate Change“, showing high temperatures around 35 million years ago indeed. But when seen in context, the 35Myr point is part of a whole different story than “CO2 concentrations driving the planet’s temperatures“: it was the end of the Eocene and of a steady decrease in temperatures, the time of the Antarctic glaciation and a brisk decrease in temperatures, the start of relatively cool 10 million years (still, warmer than today) etc etc. And so Kiehl’s context-free “it’s all CO2” work ends up looking like a tirade against people driving on a motorway at 70mph, written by somebody obsessed with analyzing what happens when people drive at 70mph, yes, but in a crowded market. Science, it ain’t: it’s just ever-the-misnomer “Science” magazine. How Long Before Romm Blames The Christchurch Quake On Global Warming? Greenland Ice Cap Receding And Disappearing!